GM has moved electric motor manufacturing from Mexico to the US for making the Chevy Spark EV, due to go on sale this summer. General Motors is changing one of the norms of electrified vehicles, where parts like the electric motor are made overseas. The company has begun manufacturing electric motors slated for the Chevy Spark EV at its Baltimore Operations plant in White Marsh, Md. This is an example of jobs and manufacturing coming to America because of electrified vehicles. GM designed the Spark EV’s motor and drive unit to provide maximum efficiency and power, producing 130 hp (100 kW) and 400 lb-ft of torque to deliver acceleration of less than 8 seconds from 0 to 60 mph. “Electric motor development and manufacturing is a critical area of expertise GM has mastered as we grow our portfolio of electric vehicles to address the needs of our global customers.” said Larry Nitz, GM executive director of Vehicle Electrification Engineering. 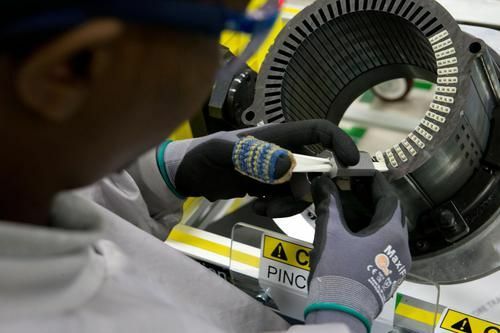 GM developed some expertise in electric motor manufacturing with a pilot factory in Wixom, Mich. Before launching manufacturing at the Baltimore plant, workers completed training on the operation of the machines used to configure and manufacture the electric motor and drive units. The Baltimore plant is GM's exclusive manufacturer of A1000 transmissions for heavy duty pickup trucks and electric motors and drivetrains for the Chevrolet Spark EV. This factory has been zero-landfill since 2007, recycling 100% of its waste. It also has a 1.2 MW roof mounted solar array, that was installed in May 2011. A new facility was built on the grounds of the Baltimore plant was built explicitly for electric motor manufacturing. This business was formerly operated in Mexico, and has been brought back to the U.S. The Spark EV will be sold in California and Oregon this summer and sales will expand to Canada, Europe and South Korea later.